31st October 2018 MBIS Secondary section celebrated the Sports day. On this day the atmosphere of the school took a festive look. A great interest was observed among the students and the parents. All of them came in a large number to enjoy the sports program. MBIS observed Competition, commitment, enthusiasm and sportsman spirit on the Sports ground. Students were ready with slogans, painted faces, posters and flags. One can witness the students, sweaty faces, shouting on a high pitch the house slogans, encouraging participants and trying hard to collect points for their houses. At the same time they were most careful not to lose points for misbehavior and discipline. Ms Jodi, the Athletics Director was always on look out for students spirit. House captains are busy talking to their house mates and collecting participants for competitions. The students of Yearbook & Journalism CCA has captured some reflections from students and teachers on the Sports day. Sports day was an exciting day and I was extremely content to participate on this great day. My favorite part of the event was the 1 mile race because this was a race which I won and which challenged me the most in terms of my fitness. I am in blue house and we came third in relay however that was because of our tactic which did not go to plan. We had planned something and something else happened. However, we were all proud of how our house did because our coordination and support for each other was tremendous and that is what kept me going while I was doing the activities. The biggest motivation for me were all the people who were cheering for our house while we all were participating. I think this day was organised well and Ms Jodi did a fantastic job in being the leader and being so enthusiastic about it. I felt the enthusiasm of everyone while participating in various activities and this was the best part of the day where everyone was enjoying. 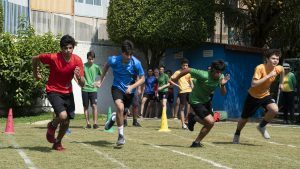 This year’s sports day was definitely demanding for blue house, especially since we were missing so many of our members. I definitely believe that one of the main things we were able to do in order to be able to build up the relationship we had with each other was through the constant support and cheering. Everyone in the team was a part of the cheering and everyone supported the people who were a part of races, but not only from our house, the others as well, to show a stronger sense of sportsmanship. As the day progressed, we realised we needed to put more effort into our team if we wanted to win and that is when we decided to take charge of what we were doing and put in all of our efforts in encouraging each other and trying our absolute best. Throughout the day there were a couple of new activities that were fun in addition to the old ones. 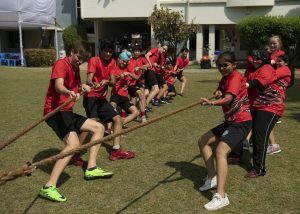 The biggest challenge for blue house was definitely the tug of war since we were outnumbered, but we did not lose hope. I believe that the biggest motivation for everyone in blue house was definitely winning for the second year in a row, but to also show everyone else what we were really made of. Everyone in the house played a huge role towards the win, and it would not have been possible without the help of every single one. Overall the sports day was a great experience filled with a lot of opportunities. What was your favorite part of the event and why? 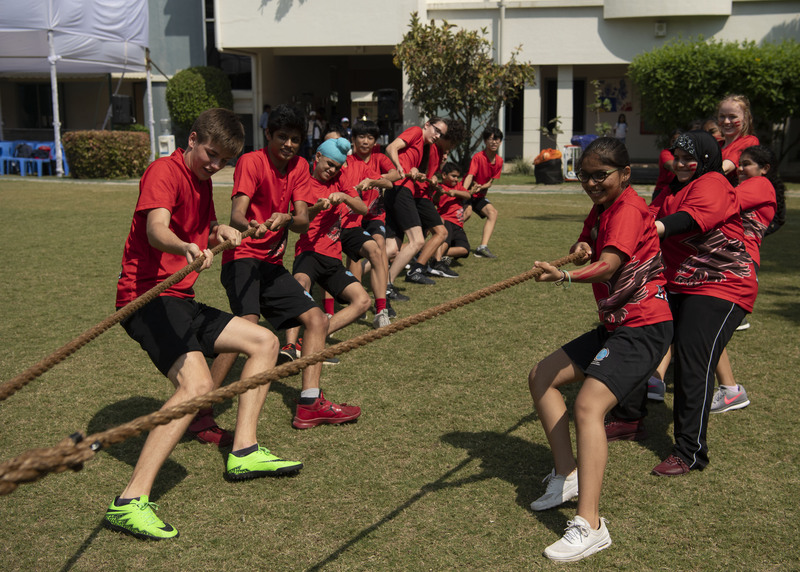 There were many parts of the day that I thoroughly enjoyed, but to me, the tug of war was the highlight as the whole house had to work together simultaneously in order to do well. I thought that this event managed to quite literally bring us all together and truly showed us how we depended on each one of us to bring the house success. What was the techniques used for the team work? We mainly tried to communicate with each other as effectively as possible, in order to work together more efficiently. What was the most challenging part of the activities? I think that trying to get everyone to participate and do it enthusiastically was probably the hardest part! Your comments on the organisation of the sports day? I think that the organization was great because as soon as we completed one activity the next one was already set up and waiting for us, and we always had something to do. What motivates you on this particular day.? Having been in the school for over 9 years, I have always looked up to my leaders during events such as sports day, and this year actually being able to be one of the leaders of my house, was quite motivational. 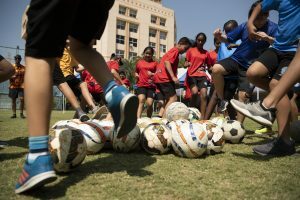 How did the students contribute to the team’s performance, any particular experience you would like to share with us.? The students are what made the team, and thus we were responsible for both the ups and downs, but I think that we should grow from this and aim for much higher in the years that follow. An experience that I think I will remember, is during my last few laps of the miracle mile, I pulled a muscle and was on the verge of giving up, but a couple of my teammates ran onto the side of the track and ran with me for the remaining laps, while convincing me that I could complete it. This was a great moment and I will remember it for a long time. Your house has earned the least points. Why do you think that was so? I think that due to the fact that some of our teammates were missing, we were impacted quite negatively as we were not as strong as the other houses. Are you enjoying this day? Yes, not only was it fun but it was also a great learning experience. 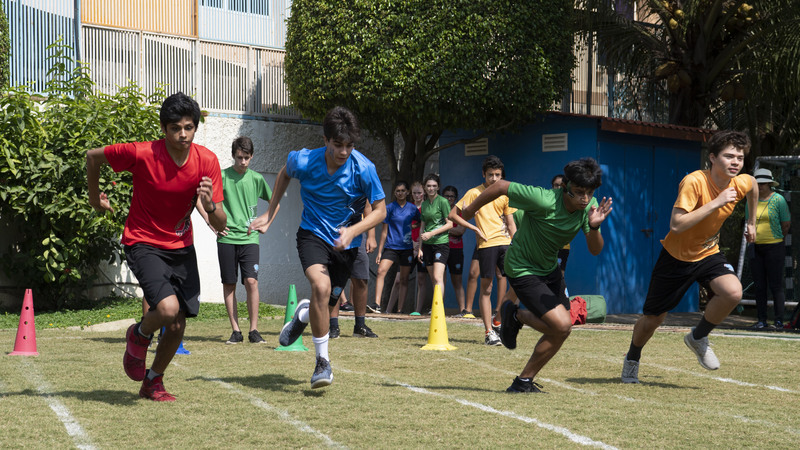 What was your favorite part of sports day and why? My favorite event of the entire day was tug-of-war. I liked this particular event because it was a good team-activity that everyone was able to participate in. It was a fun event that everyone was excited to play even if they didn’t win. What were the techniques used for teamwork? Our team used many techniques to help us earn points in sports day. We made sure to communicate and know what others were doing, we formed a plan before actually doing the activity, and we had a designated leader. What were the most challenging part of the activities? The activities themselves weren’t too challenging, but the main difficulty was staying in the heat for so long. Especially when we were running. The miracle mile was the hardest activity where we had to run 10 laps around the field (1 mile). What are your comments on the organisation of sports day? I think the people in charge of organizing sports day did a very good job, everyone was active and engaged. I try to balance sports and academics in my life such as music and horse-riding, but I tend to spend far too much time studying. Today was very refreshing as I didn’t have to attend classes on my usual school schedule. Having no responsibilities for a few hours was fun and motivated me to participate. How did the students contribute to the team’s performance? Our school P.E department helped us with preparing us for the sports we did today. Our skills in various sports were used and that is probably why our house did well today. The students in my house were well prepared and that is why we were able to complete everything in time. Our combined skills helped our team get third place this year. Did you enjoyed this sports day? Yes, I had a good time with my friends.